My first run in Venice was an ‘improvised’ one. I sat on the southern coastline of the city overlooking the wide canal of the Guidecca. The sun was setting, I had eaten a fine meal, had a glass of cool, shimmering vino bianco and was watching the sun set. The aches and pains in my legs from the marathon a few days before were fading. I would be ready to run again in a day or two. I folded up my book (Barry Unsworth’s Stone Virgin) and reached for my wallet. A few seconds later, I realised that it was on the other side of the city, still in my hotel room. The second run was a more planned affair. I wanted to run the Lido (where Aschenbach dies, having stayed too long in the city in Death in Venice). I change and pack what I can (phone, hotel keys, travel card) into my running shorts and head out into a crowded noonday sun for the Vaporetto (river bus). The air isn’t empty, there is an elemental weight to it. The Frari bells are chiming. It is now that I remember this is a bank holiday. There is no rhythm to find in such a crowd. It is one of the stonemason’s skills, the use of rhythm. It represents the mastery of efficient working practice; but not efficiency in production, instead it is in the use of the worker’s energy. The skiffle rhythm of stop-start is not a comfortable one. Having read Daphne Du Maurier’s ‘Don’t Look Now’ last night, I’m amused that one of the people I have to dodge in a tight alleyway is a short old woman wearing a blood-red knee-length woollen coat. Some of the other pathways are quieter, and even in the short time I’ve been here I know a few routes that are deserted. I don’t mind the crowds though, because I will have to stop for half an hour when I get on to the Vaporetto for the island. Two things create a city, its people and its architecture. For Ruskin, these were one and the same. His love of gothic architecture is well documented in, amongst others, The Stones of Venice, a multi volume work from the 1850s (at nearly half a million words). 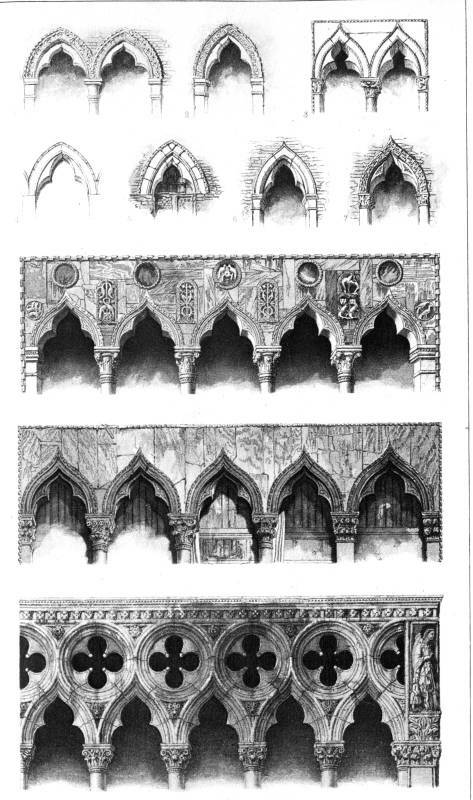 One of the many remarkable things about Ruskin was that he didn’t love Venetian gothic architecture for itself, but what he saw in it and around it, temporally as well as spatially. Like Carlyle, Mill, and Dickens, he was wary of the Victorian love of the mechanical. Manual labourers were reduced to ‘hands’ that could work in the factory. Elizabeth Gaskell’s women labourers express the point well. In North and South they proclaim that they have no intention of going into domestic service to be someone else’s skivvy. Why would they? When they can sell their labour freely on the open market, in whichever town they choose to live. They are the masters of their own domain: their bodies. The tragedy of this scene is that Gaskell’s implied reader is well aware that these working women have exchanged one kind of servitude for another more terrible one. In the increasingly industrialised world, Ruskin saw that the worker was being turned into a ‘tool’, to be beaten and used, blunted, and eventually discarded. He explains, in the Stones, ‘You must either make a tool of the creature, or a man of him. You cannot make both. Men were not intended to work with the accuracy of tools, to be precise and perfect in all their actions.’ By freeing the worker from his enslavement to the machine, society will yield, with all its imperfections, a productive cell, but more importantly, a contented one. In his previous work, The Seven Lamps of Architecture, in thinking about the rudely ornate aspects of gothic architecture, he had wondered ‘Was the carver happy while he was about it?’ Medieval ‘hand-work’ was rustic, rugged, imperfect, unfinished; a signatory expression of the worker’s identity, albeit expressed within a specified form. Victorian factory work created, with reliable rapidity, perfectly finished objects, where the mindless machine-operator was merely a faceless conduit towards the means of profit. The signature had become a stamp. The other aspect to Ruskin’s obsession with Venice was as a vibrant corrective to Victorian apathy and assumed supremacy. It was a place and a people, both of fading glory. A few years before Ruskin was born, Ludivico Manin, the last Doge of Venice had been forced to step down by Napoleon. 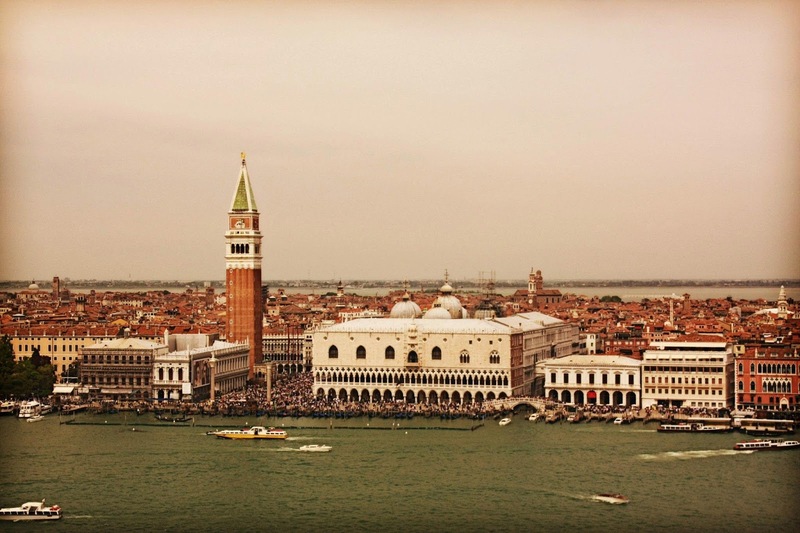 The Venetian republic, a thousand years flourishing, was over, and now the city was in decay, too. Like the great Victorian historians, Macaulay and Carlyle, Ruskin found a parallel for his own times in the past. 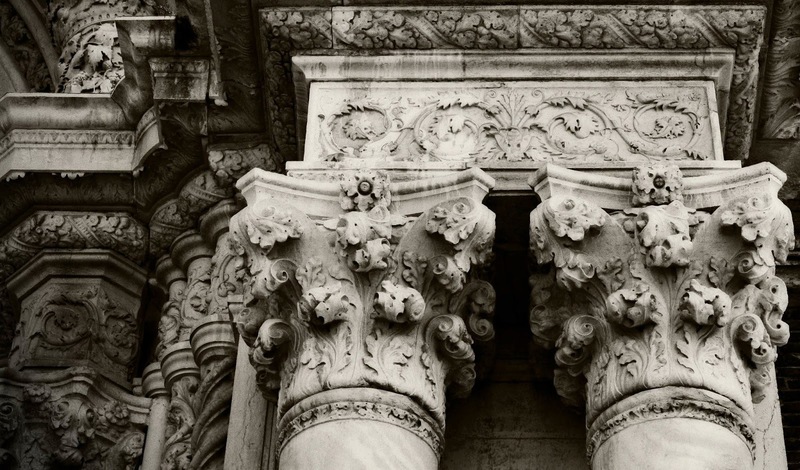 He hurriedly sketched details from columns, orders, arches, in fear that they would fade and crumble to sand, just as he believed England would. He could already see it happening in the months and years between his frequent visits. Such is the charm of Venice. Its architecture lends itself to melancholy and to death. But it’s people smile. In the Campos the children, play, run and scream with a joyful abandon that you don’t see in the deserted streets of London. For them, the fading buildings are a backdrop to something always beginning. The boat ride to the Lido takes about half an hour. I have no map, but I can hardly get lost on an island the shape of a needle. One side faces Venice, the other, the Adriatic. I a expecting to have to dodge crowds, just like my journey to the Accademia, but instead I am greeted by the overwhelming scent of yellow-flowering pansies. this is a roundabout. Why? The island is a couple of hundred metres wide and only a mile or two long, but there are a surprising number of cars, here. Straight. The beach must be on the opposite side. After the last few days if navigating a city by the sun, I catch myself spotting landmarks so I can find my way back. After a few hundred yards I have left the bustle of shops behind. I see the beach, and a runner stretching, but no one else. I smile at him, but I’m a pane of glass. ‘Ah, like London runners.’. The pathway is smooth, so for the first time in many months, the shoes come off. I’ve been so preoccupied with marathon training that I haven’t barefoot run since maybe October. It’s bliss. As soon as I take my shoes off I remember why I love running so much. The pain of the marathon is long forgotten as my feet whisper along the walkway. Onto the sand. I negotiate my way nearer the shore where the sand is firmer. There is the soft crunch as shards of shell are ground finer, each step only accelerating the work of time and these flecks’ journey to powder. There is no one on the beach. The sun is full in the sky. I must be on the wrong part of the island. I clamber over groynes making my way slowly along the coast. I become convinced that life is elsewhere, that there is something else to see, so after a mile I make my way up the beach, to the road, and to the other side of the island. Is this where everyone is hiding. But no, as suspected it is the coast facing the Venice mainland. This is the yacht described in the text. Taken while skinning the Lido. A yacht whispers into view. It has a few people sunbathing, still as corpses. The air, heavy with a glimmering silence. Never have I seen the sea so undisturbed, made stranger somehow with the backdrop of Venice in the distance. I turn to make my way back to the Vaporetto. I have an idea of how I can continue this run. 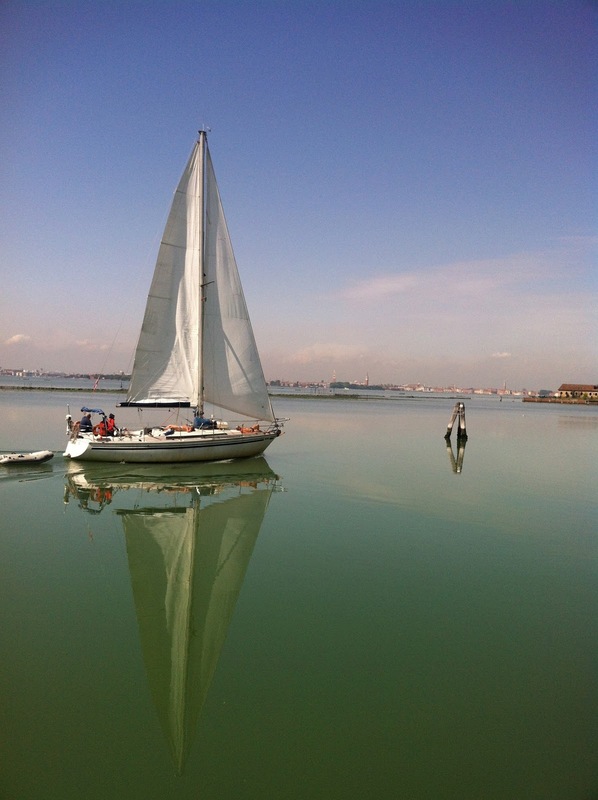 I am sort of lost, but I know I’m headed in the right direction – I can see Venice, after all. I feel a sudden urge to record this quietness, made emptier somehow by my bare feet smooching the concrete. I wrestle my phone from my pocket and turn on the video – but it only records slaps, scene-jerks and funny breathing. After a mile or so of weaving between beachfront, roads and inlets, I am woken. My olfactory sense has been so attenuated by years of medication and London that I am surprised to find it penetrated once again by the same sweet floral scent. I follow my nose left. I quickly snap the flowerbed and run for the Vaporetto which is ready to leave. The first stop is St Elena, on the eastern extremity of the island. On my way in I had spied a path that looked like it ran all the way from here to San Marco, the scene of the daily siege of Venice by the tourist hoard. Seen from the bell tower of San Giorgio across the Guidecca canal they look like ants attacking a corpse. The Vaporetto pulls away and I am like a dog in the traps wanting to continue my run. The ride back is quick. The barrier is lifted and I’m out of the boat. I turn and shout to the crowd of passengers, “I’m going to race you all to San Marco”. Being English, of course, I did no such thing. But I did want to race it. As soon as I began to run, at a much faster pace, I was immediately reminded of the time when I was eight-or-so, when on the street I used to see my mother in the passenger seat of our car in her role as driving instructor. The learners always drove cautiously on our empty streets and I would puff out my chest, straighten my hands to darts like the T-1000, and sprint in an all out race-to-the-death, leaping over unattended bikes, tightroping garden walls, until either I lost, or the car turned off route. It was later explained to me that this wasn’t quite the thing that the learner driver should have to contend with. In the first leg of the race I take a clear lead. The Vaporetto has to load passengers, and is slow to shake of its inertia. But then, I am suddenly taken off route via an inlet over a bridge, losing at least forty metres. The Vaporetto has made good ground and is now out in front, but not by much. Then another inlet, but this time with no diversion. I reach the summit and see the boat pulling in at Giardini. I keep a good pace and the boat is slow to start again. My legs still don’t remember their marathon last week. We are away. Another bridge to climb towards Arsenale and each one gets thicker and thicker with tourists whose attention waivers in all directions but this runner’s. Another bridge and my legs feel the climb of this one, but there is a long flat ahead. I let go pushing hard in the sunlight. As the Vaporetto pulls into the stop I pass it again and head towards San Marco. My legs have had enough of this game. Like the crowds, they feel sluggish and inattentive. I pass a thick-haired golden retriever looking very unhappy at being out on a lead in such weather. But I don’t make it to San Marco. In the crowd, I lose sight of the boat and it is difficult to maintain walking pace. I come to a stop outside the the hotel where Henry James had finished The Portrait of a Lady in 1880 (that he wrote about in the 1907 Preface). The challenge is over. I wipe the grains of salt and sweat from my face and feel a burning thirst. I remember that I haven’t drunk anything for hours. I turn around and retrace my steps to a quieter point at which to catch the boat back. A couple holding hands smile at me, only then do I realise that it is because I too am smiling. The desire to play is easily forgotten in someone my age, and I’m glad to be reminded of it. Creativity is not an ability, but merely a desire to romp and caper with ideas or the body. Sartre was so enamoured of play that he ascribed to it all-but the meaning of life. In Being and Nothingness, he argues that our condition is such that we spend our lives cowering in the face of our freedom. We engage in complex acts of deception to deny our biological inheritance of freedom. We structure entire lives and livelihoods around our self-deception. For Sartre, play was a way to touch that void once again. The desire to play is central to our happiness. And today, even trapped by the ant-hive crowds of Venice (of which I am one), I still find that moments of liberty are to be found in the creativity of the body. 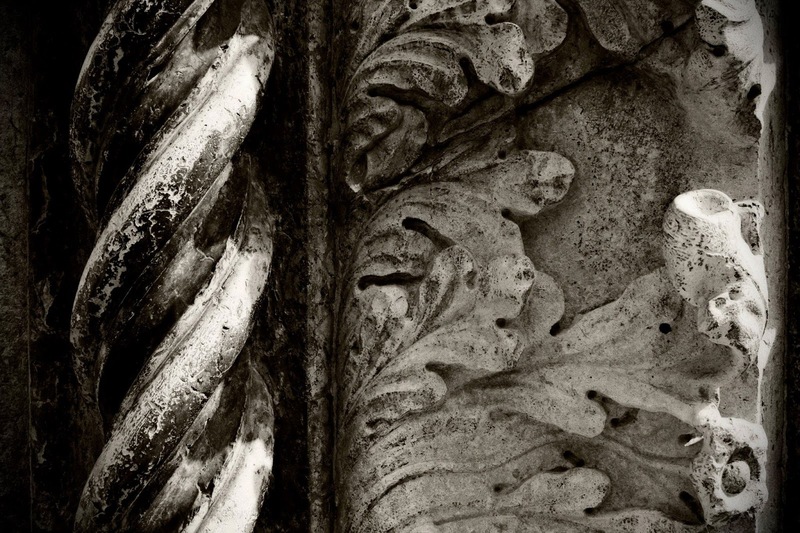 The stonemason may have to carve a gargoyle, but it is one of their own design. Even in the narrowest and most crowded of alleyways, squeezing between pot-bellied walls that look like they are waiting to belch, expression is still deliverance and release. The ‘ant-hive’ crowds of Venice.